It is widely accepted that the limited range of electric vehicles (EVs) is the largest barrier to their introduction. Current battery and materials technology limits the range and size of EVs. Combined with the EVs’ relatively high cost, “range anxiety” as it has been termed, puts off most consumers from a purchase. Why restrict yourself to a 100km range, when the whole idea of a personal vehicle is to enhance your mobility? There are workarounds. Hybrids such as the Toyota Prius and the Chevrolet Volt overcome range anxiety by combining electric motors with a petrol engine to reduce emissions. Hybrids reduce emissions now, but many engineers see them merely as a bridging technology until battery technology matures. Another alternative is to install battery-swapping or fast charging infrastructure, such as project better place. However, the development of such infrastructure is expensive, takes a long time and is also not without its engineering challenges. The best option in the end must be to develop EVs and power systems that can compete with the range of fossil fuel vehicles. Japanese initiative Sim-Drive aims to develop that technology and demonstrate it for other manufacturers to use. The project, which has been running for two years, is a spin-out from Keio University, and is funded by its 34 industrial participants, including Hitachi, Bosch, Dassault Systems, PSA Peugeot Citroen and Toyota. The development team recently announced it had achieved a range of 351km using its “in-wheel” motor system and a 24.5kWh capacity battery. Importantly, the car also offers the same amount of cabin space as a large car. This range represents a step change over current offerings. 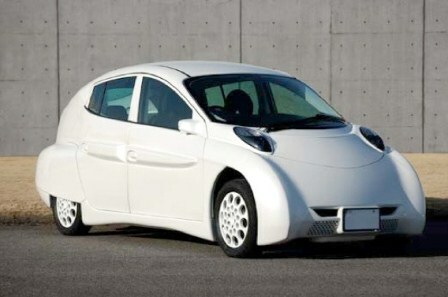 The G-Wiz offers a measly 80km range, the Mitsubishi Imiev has a 110km range, and the Nissan Leaf 160km. The project aims to start mass production by 2014. If the rather strange styling can be remedied, the technology looks like a step in the right direction for EVs. Previous articleDo electric supercars have a future? Next articleIs it a bird? Is it a plane? Or is it the quieter, more efficient aircraft of the future?